I love Christmas trees. Always have. Many of my warmest, childhood memories are of decorating the Christmas tree and waiting for Santa to bring me a Barbie, some Silly Putty, or an Easy Bake Oven. That's because I was raised in a Christian home. Pine trees and magical, gift giving elves were beloved by the baby Jesus. Remember? In the stable when Joseph and Mary were visited by the three wise men and Santa Claus, with his reindeer, and they all sang "O Tannenbaum?" Okay... Maybe I have that wrong. So, how did the Christmas tree come to be such an integral part of Christmas? Like so many of our beloved Christmas traditions they derive primarily from ancient, pre-Christian, pagan cultures. Historically, they have an uneasy relationship with Christianity; alternately rejected as pagan artifacts and claimed vehemently as Christian rather than secular. Many Christians would probably be surprised to learn that the ancient pagan practice of decorating tree cuttings, which occurred in parts of the Middle East long before the birth of Christ, is specifically condemned in the Bible. The use of evergreens has a specific symbolic appeal in the dead of winter. Many scholars of paganism and goddess worship will tell you that pine trees represent eternal life because they remain vibrant throughout the dead of winter. I read about this in far too many books when I first started exploring goddess traditions, many moons ago, for me to source and cite them all. Here is a good overview from Religious Tolerance.org. Many Pagan cultures used to cut boughs of evergreen trees in December, move them into the home or temple, and decorate them. 7 Modern-day Pagans still do. This was to recognize the winter solstice -- the time of the year that had the shortest daylight hours, and longest night of the year. This occurs annually sometime between DEC-20 to 23; most often, it is DEC-21. As the solstice approached, they noticed that the days were gradually getting shorter; many feared that the sun would eventually disappear forever, and everyone would freeze. But, even though deciduous trees, bushes, and crops died or hibernated for the winter, the evergreen trees remained green. They seemed to have magical powers that enabled them to withstand the rigors of winter. Their mid-winter festival of Saturnalia started on DEC-17 and often lasted until a few days after the Solstice. It bears mentioning that the custom of wassailing was actually a tree ritual in which the beverage was poured around the roots and the community shared the beverage with the tree. Pagans do love their trees. A very intriguing parallel between the pine tree and Christ can be found in the myth of Attis who was sacrificed on a pine tree and resurrected. Barbara Walker says in The Woman's Encyclopedia of Myths and Secrets that "The cult of Attis strongly influenced early Christianity." The worship of Attis in association with that of the Great Mother of All Things, Cybele, came from Phrygia in Asia Minor. Attis accompanied Cybele, the Great Mother of the Gods, who was brought to Rome from Phrygia in 204 B.C.E. Phrygia is an area that is often called "Thrace," a region of SE Europe comprising NE Greece, S Bulgaria, and European Turkey, bordered by the Black Sea in the northeast, and the Sea of Marmara and the Aegean Sea in the south. Attis and Cybele were established in a temple on the Vatican hill, where they remained for six centuries. Attis was a son of the Goddess' earthly incarnation, the virgin Nana, who miraculously conceived him by eating an almond or a pomegranate, yonic symbols both. Thus Attis was a typical "god without a father," the Virgin's son. He grew up to become a sacrificial victim and Savior, slain to bring salvation to mankind. His body was eaten by his worshippers in the form of bread [the Eucharist of Attis]. He was resurrected as "The Most High God, who holds the universe together." Like his priests he was castrated, then crucified on a pine tree, where his blood poured down to redeem the earth. (Walker, The Woman's Encyclopedia of Myths and Secrets, p. 77). Such myths make it clear that evergreens have long been associated with the ideas of resurrection and eternal life. Some years ago it began to dawn on me that the association between the Christmas pine tree and immortality might not be as simple as their persistent greenness. That, in fact, the mythology might be deeper and that it might have something to do with their geometric form. 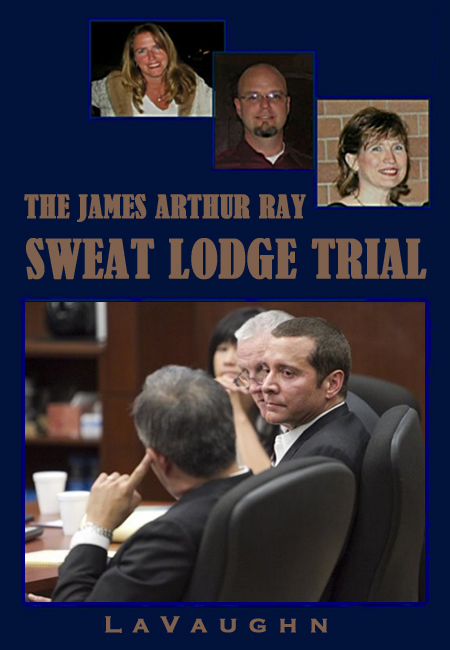 A series of events caused me really focus on the fundamental shapes and broader archetypes. 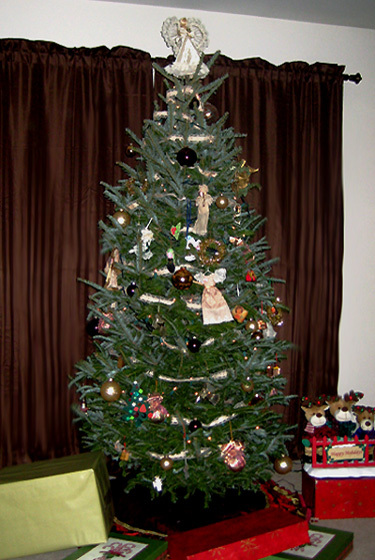 I have always had Christmas trees, real ones that filled my home with the scent of pine. Even when I lived alone, I would bring them home from a tree lot, put them up, and decorate them all by myself. But one year, I found myself unwilling to go through the hassle. I couldn't determine which would make me more miserable; finding, decorating, and disposing of a natural tree or not having one. I thought about getting a fake one but I hate them. As luck would have it, I noticed an adorable little tree woven from natural twigs in a flower shop. It was a simple cone shape, emulating the idealized form of a pine tree. I fell in love with it and decided that it would be my Christmas tree for the foreseeable future. 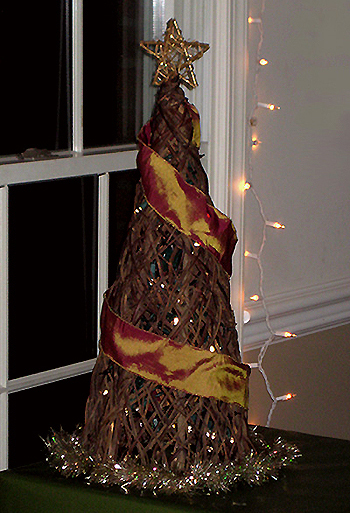 I stuffed it with lights so that it was illuminated from within and wrapped a tiny garland around it. It's decorations have gone through a few iterations over the years but I still put it out every year, in addition to a real one. Looking at my rustic little tree, I began to contemplate the shape of it and to consider the importance of vortical forms in sacred geometry and myth. It was one of those wonderfully lucid moments when the veil lifts for a second and I'm aware that I am not separate from the world around me; that the emerging archetypes in my consciousness appear in my day to day life as happy accidents and other synchronicities. As I explained here, I experienced a similar shift in awareness around the image of the cornucopia last Thanksgiving. Vortical forms represent the act of manifestation; of creation emanating from the void. Spiraling vortices represented by cones and triangular shapes are innately entrancing. And if it weren't clear from the cardinal shape of the pine tree that we are drawn to its vortical nature, consider how we decorate it. The classic use of the garland, which we coil up the tree like the snake on the rod of Asclepius. (Note that the ancient Greek pine tree myth, referenced above, involved the resurrection of Adonis by Asclepius.) 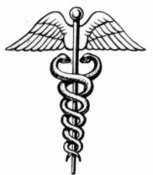 Or like the double helix form of the staff of Hermes, aka. the caduseus wand. And like the caduseus, our tree is often topped with wings. See my lovely angel tree-topper in the photo above. Another classic tree-topper is also a symbol rich in mythical and mathematical significance: the star. A pentagram like the one on my little twig tree is made up of phi ratios. The phi ratio, or golden mean, is the foundation of the golden spiral which unfolds into the vortical form that expresses in the pine tree. The phi ratio, of course, shows up all over the natural world and is vividly apparent in plant and animal life. (The gorgeous, little video I posted here illustrates this beautifully.) One of the most accessible manifestations of this logarithmic spiral is in the pine cone. And it is the symbolism of the pine cone that makes the pine tree's association with the Christ most interesting. The pine cone is actually one of our most sacred symbols. It appears on the staffs of spiritual luminaries all across the mythical and religious spectrum; from Osiris to Dionysus to the Pope. This page has some great illustrations and offers the added benefit of being hilarious. Best line: "Osiris was the Egyptian counterfeit of Jesus Christ!" Those Egyptians were diabolically clever in the way they managed to ape Christian symbolism. Because, you know, if you really want to undermine Christianity, you need a good time machine. The pine cone is so strangely ubiquitous, yet subtle, because it lies at the very heart of the mysteries. It is a symbol for that tiny gland named for it: the pineal. Here Manly P. Hall explains its relevance in Masonry. Sufficient similarity exists between the Masonic CHiram and the Kundalini of Hindu mysticism to warrant the assumption that CHiram may be considered a symbol also of the Spirit Fire moving through the sixth ventricle of the spinal column. The exact science of human regeneration is the Lost Key of Masonry, for when the Spirit Fire is lifted up through the thirty-three degrees, or segments of the spinal column, and enters into the domed chamber of the human skull, it finally passes into the pituitary body (Isis), where it invokes Ra (the pineal gland) and demands the Sacred Name. Operative Masonry, in the fullest meaning of that term, signifies the process by which the Eye of Horus is opened. E. A. Wallis Budge has noted that in some of the papyri illustrating the entrance of the souls of the dead into the judgment hall of Osiris the deceased person has a pine cone attached to the crown of his head. The Greek mystics also carried a symbolic staff, the upper end being in the form of a pine cone, which was called the thyrsus of Bacchus. 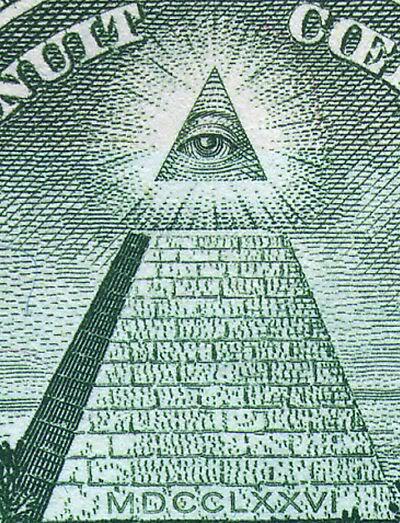 In the human brain there is a tiny gland called the pineal body, which is the sacred eye of the ancients, and corresponds to the third eye of the Cyclops. Little is known concerning the function of the pineal body, which Descartes suggested (more wisely than he knew) might be the abode of the spirit of man. As its name signifies, the pineal gland is the sacred pine cone in man – the eye single, which cannot be opened until CHiram (the Spirit Fire) is raised through the sacred seals which are called the Seven Churches in Asia. Some of that may explain how it ended up on the B-side of the Great Seal and why the truncated pyramid has its own little tree-topper; I reference it here as the benben stone of Egyptian creation mythology. The benben is alternately described as a pyramidion and as the mound that emerged from the primordial waters. It decorates the tops of pyramids and obelisks all over Egypt. I have little doubt that it is really a symbol for the pineal gland which the ancients recognized as the key to regeneration and eternal life. So it is not so surprising that we would emulate the placement of the benben every Christmas when we complete our decorated pine tree with a star or angel or other radiant ornament at the very top. Because at Christmas we celebrate the birth of a "god" who enacted the age-old myth of resurrection and glorious ascension.